Fielding Environmental is a cleantech company specializing in the recycling of waste solvents, glycols and refrigerants. Fielding Environmental used nitrogen gas as part of their process in the plant to purge critical lines in the facility. Their existing nitrogen generator had no backup unit so downtime was a possibility in the event of unplanned shutdown or maintenance. When Fielding’s existing generator had a critical failure, they first called their existing service provider, but were told that the nitrogen technician was on vacation and would not be onsite for 3-4 days. They immediately turned to CRU AIR + GAS, and we had our nitrogen specialist on site in less than 1 hr. 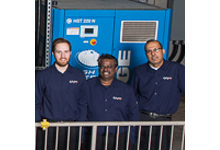 CRU AIR + GAS’s nitrogen specialist determined that the carbon bed in the existing nitrogen generator had failed. This is a critical failure on the unit and would need to be replaced at a cost of more than 60% of the unit cost. 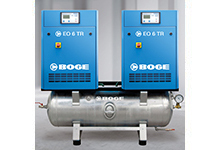 CRU AIR + GAS was able to find a BOGE nitrogen generator in stock that could be delivered and installed within a week. The unit would include full MODBUS communication capabilities and so Fielding Environmental approved the project immediately. Fielding Environmental was able to integrate their new BOGE nitrogen generator into their HMI system and have complete visibility on nitrogen production and purity. Their existing generator became an emergency backup to be used during maintenance of the new generator. SIAD's new CO2 piston compressor for the food industry ensures all the quality standards of the gas, while maintaining high performance. 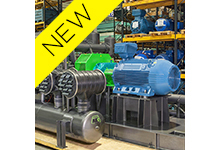 CRU AIR + GAS is a proud supplier of the latest air compressor, special gases, and air treatment products. We are Ontario’s top compressed air expert for energy audits, retrofit projects, compressor sales, and dedicated on-call service. With CRU AIR + GAS you can leverage the industrial compressed air knowledge you need to make the right decision.